We began this new millennium with the first quarter's study of one of the crucial Message and Mission themes: Our assurance of salvation in Christ. It is fitting that in the second quarter of this new millennium our study will touch on another Message and Mission theme: The certainty of the Second Coming in the context of the everlasting gospel. In this Bible Study Guide, we will examine some of the distinctive doctrines of the church as they relate to the certainty of our Lord's second advent. Such doctrines will include the authority of the Bible, Creation and the Sabbath, salvation, the sanctuary and the judgment, the witness of the remnant, death and resurrection, the millennium, the end of evil, and the beginning of the new earth. We will discover that the doctrine of the Second Coming does not stand in isolation, but it is the grand climax of the everlasting gospel and is intertwined with many of its teachings. When we question any fundamental Bible teaching, we also raise questions about the Second Coming. We also will explore the meaning of doctrine itself. We will see that doctrine is not an end within itself but is an essential element in establishing our relationship with God. What is central to Christianity is the message that we can be reconciled and restored to fellowship with God through Jesus Christ. Christianity is a relationship with God that matures when it is built upon biblical teaching and lifestyle. We will see that our relationship with Him does not do away with law and doctrine; rather, it establishes them. May our study this quarter bring certainty and peace to our hearts as we joyously anticipate the imminent return of our Lord. May it affirm our faith in the blessed hope as the culmination of the gospel message for planet Earth. "The second coming of Christ is the blessed hope of the church, the grand climax of the gospel. The Saviour's coming will be literal, personal, visible, and worldwide. When He returns, the righteous dead will be resurrected, and together with the righteous living will be glorified and taken to heaven, but the unrighteous will die. 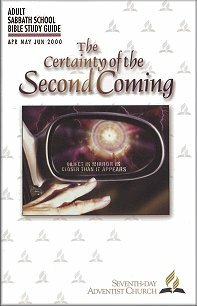 The almost complete fulfillment of most lines of prophecy, together with the present condition of the world, indicates that Christ's coming is imminent. The time of that event has not been revealed, and we are therefore exhorted to be ready at all times." "Fundamental Belief, 24" in Seventh-day Adventists Believe... A Biblical Exposition of 27 Fundamental Doctrines, edited under the direction of the Ministerial Association of the General Conference of Seventh-day Adventists from materials compiled by P.G. Damsteegt (Hagerstown, Md. : Review and Herald Publishing Association, 1988), p. 332. Edward Zinke was an associate director of the Biblical Research Institute of the General Conference for 14 years and author of several Sabbath School teachers lessons. He is the son of missionaries. His father, a medical doctor, was very active in raising churches in both North America and Mexico, where they resided for four years. Elder Zinke has a B.A. in theology from Loma Linda University, an M.Div. and an M.A. in Old Testament from Andrews University. He achieved doctoral candidate status in theology at Catholic University of America. While at the Biblical Research Institute under direction of Dr. Gordon Hyde, Elder Zinke was the catalyst and organizer of the 1974 Bible conference in the North American Division and subsequent Bible conferences in France, Germany, East Germany, Brazil, Argentina, Peru, and Australia. As president of the Adventist Theological Society and in conjunction with the Inter-American Division and Biblical Research Institute, Elder Zinke organized the first International Bible Conference, which was held in Montemorelos, Mexico, in 1996. He was also closely involved in organizing the first Jerusalem Bible Conference, held in June 1998. Elder Zinke and his wife, Ann, are the owners of Ann's House of Nuts, an importer, processor, and distributor of nuts and dried fruits. They have three sons, David, Doug, and Devin. Two are active in the family business and the third is a student at Southern University. The Zinke family enjoys cross-country backpacking and international travel. Jerry Giardina of Pecos, Texas, assisted by his wife, Cheryl, prepares a series of helps to accompany the Sabbath School lesson. He includes all related scripture and most EGW quotations. Jerry has chosen the "New King James Version" of the scriptures this quarter. It is used with permission. The study helps are provided in three wordprocessing versions Wordperfect; Microsoft Word; RFT for our MAC friends; and HTML (Web Pages). Associate Editor: Lyndelle Brower Chiomenti. Editorial Assistant: Soraya Homayouni Parish. Art and Design: Lars Justinen. Pacific Press Coordinator: Paul A. Hey. Copyright � 2000 General Conference of Seventh-day Adventist. All Rights Reserved.